Generation Zero was near the very top of my most anticipated video games of 2019. I'd played it at PAX last fall and liked it a whole lot, and loved spending more time with it in the beta. At that time, it felt like a true beta, rather than something like a marketing tool the way some studios use them lately. Issues needed to be worked out and if they were, I felt confident I'd have a great time with the game. Sadly, the game at launch displays the same issues seen in pre-release — leaving this game about life-threatening super AI feeling more like a machine out of order. The premise of Generation Zero is ultimately its strongest suit. It takes place in an alternate history version of Sweden in 1989, where the nation had stockpiled on armaments following World War II so they could never be bullied by external powers again. Deliberately vague, the story from there is mostly left to one's own devices. Weaponized artificially intelligent machines do what they tend to in science fiction — they go awry. Left as one of the few survivors in a gorgeous sprawling open world, players are meant to scavenge, prepare, and take down these various machines by any means necessary as they follow narrative bread crumbs at their own pace. The great premise can only carry Generation Zero for a few hours before its multitude of issues start really getting in the way. Inventory management is a major part of the game and you'll need to constantly make choices as to what you want to carry and what you must leave behind. That can often be very fun, but the way you navigate and organize your inventory is simply broken. For one, it's slow going as the menus clearly weren't optimized for consoles. Worse, while you can assign certain items to inventory shortcuts on the D-pad, once you have exhausted your supply that slot is left empty, even if you've since picked up more of that item. I set one shortcut to health kits, but after I would use those that were assigned at that time, I had to return to the menu and reassign the others I had since picked up. They don't automatically stack. I've never seen a game launch so counter-intuitively in this specific way. The same goes for combat items. The game really wants you to plan out an attack in co-op using noisy distractions and strategically placed incendiaries and explosives, but because the system is so slow and the enemies so numerous and fast, you're left to mostly just spam them with bullets and hope you can take them down before they deplete all of your revival items. I say revival and not healing because the enemies are extremely tough and they'll deplete your normal health kits fast anyway. Trying to peer into an alternate dimension where these crucial systems worked well, I could see very difficult robot enemies would actually be a lot of fun and a worthy challenge. In this universe, it's just broken and unfair. Enemies seem to avoid following you indoors into residences, but sometimes bugs would let them enter or even suddenly appear. When that wasn't happening, they were often shooting or charging through walls and still delivering damage. Lower tier guns display comical levels of recoil. Maybe they were going for realism, but it ends up feeling untenable. The enemy threat indicator is meant to behave like the one found in Far Cry, but again these robots are so smart that they seem to always track you down fast — inevitably leading to more broken combat in a game that is intended to let you pick your battles. Even mission markers regularly mislead you, which is perhaps the most frustrating of all given the huge XP boosts you get from completing missions. If you want to string together a few missions quickly to level up and unlock more from the well-designed skill tree, it's very tough to do so because the game constantly lies about where you need to go next. That leaves you under-leveled against antagonists already quite capable of beating you down fast and hard. When bugs and broken systems aren't getting in the way, the game still has its moments of charm and potential. It became a supremely confounding experience to play Generation Zero because so much could go wrong, but then occasionally things would flow correctly and I'd feel like I did back at PAX — excited and hopeful. More often, it was the quiet moments in between combat where I was exploring the massive map where I really appreciated the game. It's undeniably beautiful, built on Avalanche's in-house engine, but in Generation Zero they show a restraint that seems foreign to the same studio who birthed Mad Max, Just Cause, and RAGE 2. In Generation Zero, one can attain serenity with the quiet breeze of retro Swedish forests as the sun sets on the water. It's an uncommon feeling for this developer, but they impressively nail it. As mission structure is relatively open following an introductory section, there is a lot of freedom involved too, even when you're playing co-op. You can go off and do your own thing or stay close and work as a group. Both are interesting enough to merit lots more play time if and when the game gets its many wrinkles ironed out. Enemy design is also varied and fascinating. Each time a new enemy is introduced, it just happens — no major introduction, no cutscene. They'll just start appearing if you travel far enough into the game or, it seems, up your skill tree. This brings a great sense of discovery and even intended intimidation because if you don't scout an area from a distance, you may be walking headlong into a battle you can't win. Of course, that's often the case due to aforementioned issues anyway, but in that alternate universe version of this game that I mentioned, this is Generation Zero's best attribute. Maybe that can be the case in this universe someday, as Avalanche has addressed early concerns in a recent blog post and promises fixes and content, both paid and free, are all on the way. Achievements in this game are mainly cumulative with only a few focusing on specific missions. That sort of arrangement seems to reveal the game is intended to be played with less structure than one might expect at first, but it makes for a good list since it requires a lot of exploration and specific robot hunting, much like the studio's other under the radar game upon which Generation Zero is built. Rarely is the delta between my expectations and reality as vast as it is with Generation Zero, and yet never have I remained more hopeful for a game I've scored this low. There are numerous issues here that no one could rightly overlook, problems that damage the very core of what this game is meant to be. They don't take very long to see, and yet, neither are they irreparable design flaws. There are bright spots too, like its exploration, skill tree, and enemies which remain interesting. If Avalanche can improve the inventory system, fix quest tracking, and get it so the enemies can't cheat through walls and other physical spaces, they'll have repaired most of what ails these dysfunctional machines. 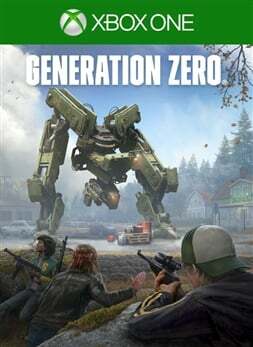 Generation Zero isn't the game I wanted it to be today, but in a world where games are alive and changing all the time, I'm hoping the singularity is still near. The reviewer spent over a dozen hours in Sweden, rocking a mohawk and getting leveled by intimidating AI monsters (and inadvertent issues) quite often. A review code was provided by the publisher.